It really makes the whole business building process a LOT easier if you focus on your best offerings. You will ease your stress AND be profitable faster. I’ve struggled with this myself, and so have many of my clients. When your brain is bubbling with new ideas and opportunities keep coming your way, it’s easy to spread yourself too thin. 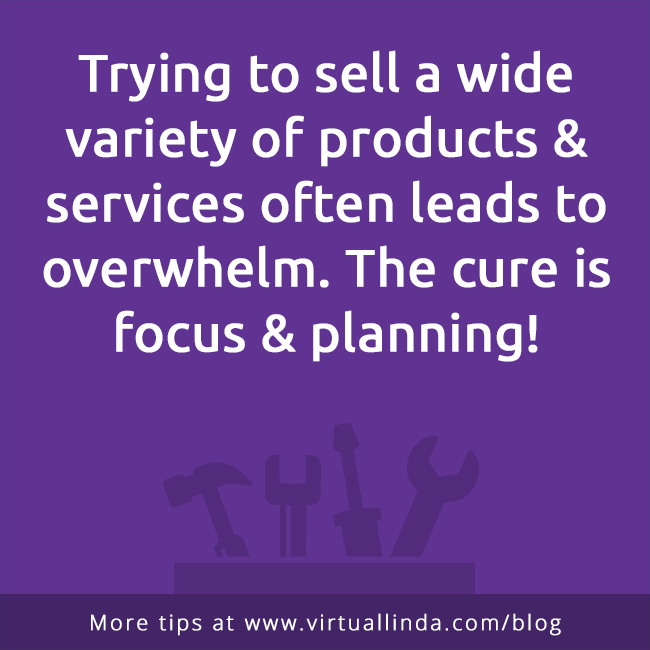 I became burned out from working long hours trying to keep up with too many products & services. I started to focus (something that does NOT come naturally to me) after realizing the benefits. It became easier to say NO to the wrong things and YES to the right clients. This was a huge step forward in my work/life balance! These steps start with picking one thing to focus on, then show how it will impact all the steps after this. Start with what is the easiest to sell and the most likely that people will buy. This is your “fastest path to profits”. Most times this is not your most expensive offering. Select what is easy to sell and keep repeating the process. Let’s say you have 2 business ideas (or different things you are selling). Take 8 hours. Divide in two. That’s only 50% of your time – AT MAXIMUM EFFORT on both. Keep dividing that with every new idea or task you need to do. You can’t be the most effective with this. However, if you FOCUS – you are starting with 100% of your available time, money & energy to get the most results with the least effort. Focusing doesn’t mean abandoning other products and services. It means that you know which one is the fastest to sell as the FIRST THING to a client/customer. Your sales funnel can include “upsells” as they are about to purchase or later on. Think about the LIFETIME VALUE of a customer/client – it may be much greater by breaking down what you sell into smaller chunks. When you actually evaluate what your fastest path to profits is, it’s much easier to say NO to things that don’t align, or stop yourself from getting distracted by “bright shiny objects” — anything that isn’t directly connecting you to your priorities. Use your limited time on your most profitable actions. All networking & marketing efforts should support your business goals. If you’re feeling scattered, start by reviewing the the overall direction of your business. Then think about your S.M.A.R.T. goals for the next 30-90 days to take you one step closer to your long-term goals – Specific, Measurable, Action-oriented, Realistic, Time-based. Your target becomes the people that are looking to buy this ONE product or service. Your offering should solve their biggest challenge. This makes it much easier to find this ONE audience rather than “everyone”. The marketing message on your website, business cards and marketing materials can be very focused. You can focus in on the reasons that your target audience should buy this ONE PRODUCT OR SERVICE – not everything that you offer. When I was struggling in the early years of my business, I attended a LOT of events, which then put me even more behind on things. Instead of booking your networking calendar solid with events, you can easily evaluate why you want to be attending events. It is to meet your ideal client? Get new business ideas? Just because you are interested in hearing the speaker? It’s no longer enough for me to hear about events – I really want to know WHY I should attend, because I can easily see if I will be getting a good return on my investment of time, money & energy. You’ll be able to have similar sales conversations with people because you are selling the same thing over & over again. You can work off a “script” or at least a typical structure for your conversations. You can develop standard questions and/or a format that streamlines this process. As you tighten up your message, you’ll get better referrals because people will know what problem you solve. You can be the go-to person for this niche. Create a profile of a good referral partner, and look for people that match. Often this will be industry-specific, from businesses with products or services to what you are selling. As you connect with people on social networks, people will be checking out more about you. There’s limited space – so you can’t list a bunch of options for people. Use the design of your profiles to highlight your new marketing message.